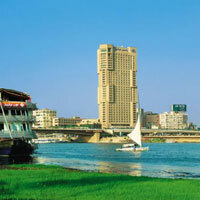 The Ramses Hilton is an excellent base for exploring this amazing city. Take in the breathtaking views across the Nile to the distant Pyramids from the Windows on the World roof-top bar - sensational at sunset! NB: during July and August the hotel is extremely busy due to the Gulf States tourist influx. Due to its fabulous location this hotel would be ideal for couples wanting to explore the Egyptian capital and experience a bit of luxury. Please note this hotel is only available as part of a twin centre or cruise and stay holiday.